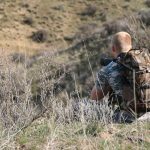 2.7 What to look for while buying a best solar backpack? The backpack has enough storage allowing you to keep all travel essentials easily without stuffing items or compromising on your travel needs. It boasts 25L of capacity and an easy access to every corner and pocket of the bag. It can easily accommodate laptop of all sizes. 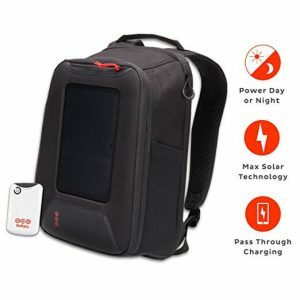 The high-quality solar panels perform amazingly and capture solar energy which is eventually saved in the power bank attached with the backpack. The monocrystalline solar cells capture the solar energy fast and allow you to charge your devices on the go. The backpack is highly user-friendly and can be used in every climatic conditions. It converts solar energy even when it is cloudy and no regular sunshine. Unlike other solar backpacks, this product controls the power current and transfers a regulated current to your devices. It can charge a standard laptop in 6 hours and a smartphone in 1 hour. The quality of the material used for construction is questionable. Also, it doesn’t come with a proper user manual. 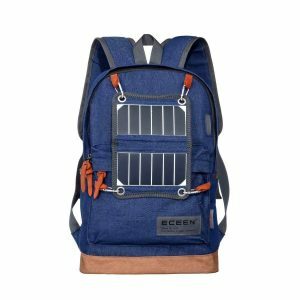 ECEEN 7W Solar Backpack offers a regular supply of mechanical energy by converting solar energy, fast and easy. 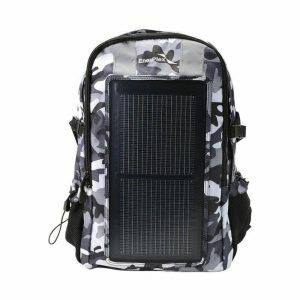 The backpack boasts 22% solar cell transfer rate which is fastest in its category. You can charge a number of gadgets as they are compatible with the solar backpack. It is a well-designed backpack with separate sleeves for gadgets including a laptop sleeve, smartphone sleeve, tablet sleeve and a separate sleeve for USB cables. It is perfect for outdoor expeditions as the fabric used is of high quality and made perfect for outdoor conditions. Easy to organize, the backpack has several pockets to keep all types or gadgets perfectly. It weighs only 3lbs which makes it a lightweight backpack for outdoor adventures. It can capture sunlight even when it is shady or cloudy and generate electricity. A few functionality issues are quoted by users pertaining to the solar panel and no charge after a few uses. Eco-friendly construction made of 100% recycled PET bottle. Ergonomically designed and has multiple pockets to keep a range of gadgets organized and sorted. Compatible with a variety of gadgets including professional cameras, laptops, smartphones, kindle and tablets. It is ultra-light in weight which makes it easier to carry it along for long hiking, biking or other outdoor expeditions. It is an eco-friendly item that lasts 5 times more than any other standard backpack available in the market. Easily accommodate a laptop measuring 15” as well as a tablet measuring up to 10”. Not an efficient solar panel like the outer counterparts of the product from the same brand. The solar-powered backpack has a connected 10,000 Mah battery that can be used to store power for future needs. It is compatible with a diverse range of gadgets including tablets, mobiles, and laptops from different brands. 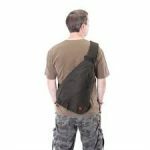 Extremely lightweight, it is perfect for outdoor activities where you need to carry a minimum load. It can withstand extreme climatic conditions and made especially with no wear and tear fabric. Complimentary cable set and the high-end Lithium-ion battery is counted with this bag. It has different compartments to keep items separate and organized for travel purposes. It is made highly user-friendly and offers supported back and straps for easy maneuvering. The 10,000 mAH battery has lesser capacity to support a 2-3 day outdoor travel. It is claimed to have a low-quality construction and the fabric rips apart on quite a few places. It is fitted with 3 watts solar panel that delivers uninterrupted power supply. It uses Patented CIGS technology that is reputed for offering the best density to weight ratio while using the thinnest and most flexible solar panels. It is divided into different segments and each segment allows enough space for a unique gadget. It is ergonomically designed for users that enjoy long expeditions and thus offer them ultimate support. It is lightweight and has a 500 mAH battery connected with the solar panel for reserve energy accumulation for future use. It can easily accommodate laptops measuring 13” and a number of other gadgets that we generally use. Low-quality construction and color variance is the most frequently reported issue with this solar backpack. The solar backpack has a built-in 2000 mAH battery that allows easy charging even when it is dark, shady or cloudy. What makes is unique is the foldable and removable solar panels that allow 22% more efficient charging ability. The battery has a LED light system that offers three different settings that can be used at night. The fabric and construction of the backpack boast high quality and user-friendliness with powerful and adjustable straps, padded back and lightweight construction. The backpack is highly durable with quality construction and user-friendly built. It comes with 10 pcs led chips, sensitive touch 3 modes for Light Modes that suit your outdoor expedition needs. The fabric used for the construction is heavier than other counterparts and also, it is bigger in size. 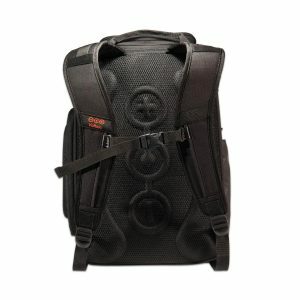 What to look for while buying a best solar backpack? The first and foremost thing to look for in a solar backpack is a powerful design. 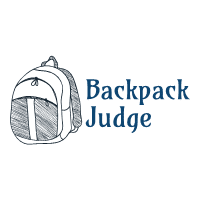 The conventional design for backpacks is termed as REPPS (Rucksack Enhanced Portable Power System) but with a change in technology, there are several new and modern designs available. Whichever design you buy, keep in mind the needs that you seek from the backpack. 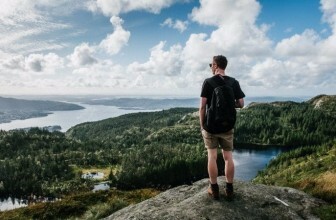 You will need a bigger backpack in case you love long outdoor travel and smaller and compact backpack in case you are buying it for college use. With the advent of technology, there are score of gadgets that we use in our daily life. 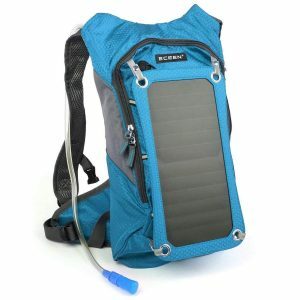 While buying a solar backpack, make sure that it has USB ports and cables compatible with all types of gadgets that you are willing to carry along in the backpack. Also, check that if it allows charging any brand gadgets. There are a variety of solar panels available in the market that operate on different technology. While some allow the direct charge, others need a power bank to charge first and then the gadgets. Also, different solar panel types have different charging ability and efficiency. You must check the manufacturer’s guide about the product and buy a solar backpack according to your needs. Just like a conventional backpack, you must expect durability from your solar backpack. A quality backpack should offer you longevity along with comfort. You will primarily use a solar backpack outside the house and most of the time in harsh and tough conditions. Durable fabric ensures you that the backpack will retain its quality and look even after a long and rough exposure. At last, it is important to consider the price of the bag. We all have a set budget and buying an item under the budget is always recommended. You can get a variety of choices in your set budget. 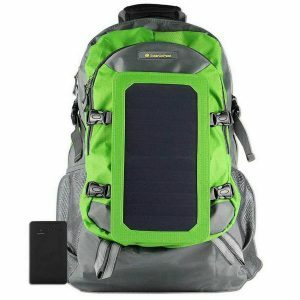 A quality solar backpack allows the user to enjoy uninterrupted charging for their gadgets while they are off the grid. 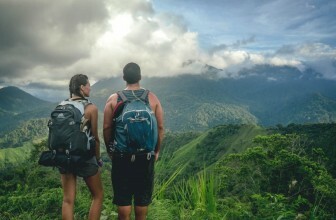 There are several companies that offer different types of solar backpacks. The above mentioned best solar backpacks are voted as the top variants available. 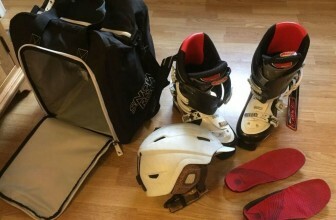 However, a user must check a solar backpack thoroughly before buying one. We have also mentioned a few tips that will aid you in making the best buying decision.